There are three biggies when it comes to adventure locales: the dungeon, the wilderness, and the city. Chapter 5 helps the DM bring them to the table for 5th ed. This is another chapter which, to be fair, has been done to death across more than the various D&D editions. It’s a staple of articles, blogs, and every other GM toolbox publication out there. But, what we get here is good, succinct and crucially, relevant. 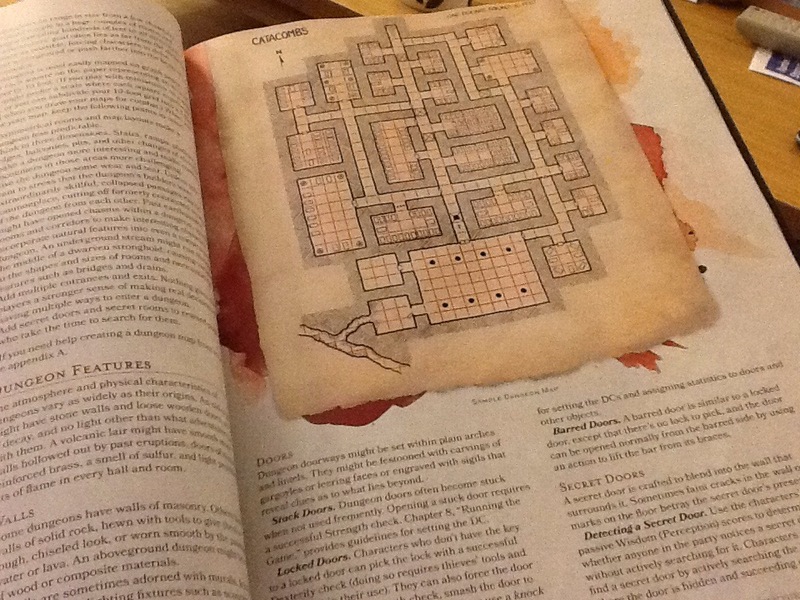 The dungeon section gets stuck straight into tables to roll on or seek inspiration from. They include, location (including exotic), creator (including sub tables for cults and religious groups, alignments, and class), purpose and history. Then some advice for inhabitants and playing off factions. It’s finished off with a run down of fixtures, fittings and hazards, which is a bit dull really. Sometimes this DMG does this, it zooms in on some sections (rules for doors) but stays vague and loose on others. I think this is a preference thing rather than a focus thing. But for me it means skimming a few bits to be honest. Also, not much on stocking the thing at this point, and for me, the monsters can have an effect on the design so probably bear that in mind. And being really picky, the sample map doesn’t make me want to explore it, and that’s a rare feat indeed. Wilderness. Rather than head directly to nuts and bolts we get a couple of essays on travel-as-montage and an hour-by-hour approach. It’s a good read. After that it’s back to the tables to stock your maps. They include: monuments and weird locales, as well as brief discussions on lairs, ruins, strongholds and settlements. Now, back in the day, each of those environments merited entire hardback volumes all to themselves. I say merited, I never personally got much use out of them. What’s presented here is a call back to that, but it’s brief, to the point, and easily skipped if you like. I’ll take that. Settlements. Again, a classic subject with city books and town guides galore. This DMG hits the randomiser button again for settlements themselves, and the buildings as well as the random encounters you could have within them. It’s all fine, and I rolled up a couple of samples, and they got the grey matter firing. As with the other sections, this doesn’t work as a read, but it does work as a tool to be used. I like that. This stuff is designed to see DMs get dice and note paper out and actually start doing the thing that DMs should be doing, creating. It’s something that I’ve slacked off on in recent years, but this book really encourages it. There’s some more stuff in the chapter. Brief looks at under/sea and airborne locales, and then traps. Traps? Here? Yep. You can tell the age and or edition of choice of a person by their approach to traps. From the early days of Grimtooth, to the 4e approach of them as a combat component. This book rolls them into the environment chapter on the basis that they are part of the scenery I guess. There’s no hint of xp for defeating them, which is a change. We get eight examples, which is perhaps a little mean, but they act as templates for your own flavour as well. Still, seems a little cursory. Only a couple of chapters to go in the Mastering the Adventure section now, and I can see how the individual chapters all hinge off of one another. I’m learning as I read (and after 35 years behind the screen I didn’t know I’d still be learning) and I’m keen to read more so I can pull all the threads together. Even now, I reckon I’ve got enough to create my own world and campaign, and that’s quite a big deal.